There are various types of diagnostic testing utilized by our chiropractic office, including X-Rays, MRI, CAT Scan and needle EMG testing. X-Rays are sometimes helpful in determining the severity of a patient’s condition, which will be decided after the initial consultation and examination of the patient’s injury. 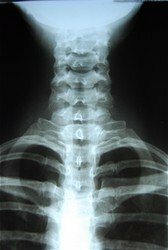 X-Ray radiology can often help diagnose many conditions, such as degenerative conditions, arthritis, fractures, vertebral misalignments and scoliosis. X- Rays are also helpful in analysis of your posture, and these postural imbalances can lead to long term problems. The Doctor of Chiropractic can identify which course of exercise therapy and chiropractic care is appropriate for your specific condition by doing X-Ray analysis. 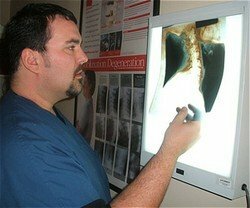 Our office commonly refers patients to Lansdale Hospital for X-Rays, but any hospital can also perform these for you as well. Magnetic Resonance Imaging, also referred to as MRI‘s, are often helpful for your chiropractor in diagnosing musculoskeletal conditions, disc injuries, ligament damage, spinal stenosis, cartilage damage, and can also be part of a follow up protocol to an X-Ray. An MRI is able to show more detail than an X-Ray, and is commonly ordered when a disc herniation or slipped disc is predicted as the cause of your problem. There are two types of MRI, closed MRI and open MRI. A closed MRI has the patient placed into a long tube, whereas an open MRI allows the patient to only place a certain body part under the machine, which is preferred by patients who suffer from claustrophobia. The traditional closed MRI is preferred when possible due to the improved detail of the images. Both types of MRI testing are a preferred non-invasive method which does not involve radiation. Your doctor will review the MRI report with you after your test is complete, and explain your findings and treatment options for your injury. Our office refers patients to a few MRI facilities in the North Wales, pa area, including Colmar MRI and Advanced Diagnostics. We can also send a copy of the report to your family doctor as well. Why order a CAT Scan? Computerized Axial Tomography, or CAT Scans, are commonly helpful in diagnosing head trauma, swelling, and possible organ damage. A CAT scan can also show muscle, ligament or disc injuries, but the MRI remains the preferred choice of testing due to its detail and clarity. Some CAT Scan testing is available at your local hospital, where as MRI facilities are usually independent locations. Our office commonly refers patients for CAT Scan testing when appropriate for concussions as well. Needle EMG testing is an effective way of diagnosing any referral pain, pinched nerves, or nerve damage which is affecting the upper or lower extremity. These symptoms are usually characterized by numbness, tingling, or loss of strength in the arms or legs. Chiropractors works with many Neurologists and Orthopedic surgeons in the area and can refer you for possible neurodiagnostic testing when clinically indicated. Our office can review the Needle EMG report with the patient, and discuss treatment options plans that are appropriate for your findings. Our North Wales/ Lansdale Pa chiropractic office has scripts available for many Radiology and MRI facilities in the area and can recommend the closest one to you when needed.